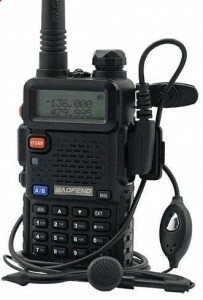 This little dual band (plus Broadcast Band) transceiver is amazing value for money. As it's designed for commercial and PMR use in addition to amateur radio, there's nothing to stop it from transmitting outside of any particular band so care needs to be taken when programming the transmit frequencies' parameters. Although the radio can be used by entering frequencies directly from the numerical keypad, it becomes a pain when you need to enter the parameters for repeater operation: transmit CTCSS tone, input/output frequency offset, the direction (- or +) of the offset etc. It's much more convenient to program some (or all) of the radio's 128 memory channels. Although this is a bit tricky, it only has to be done once and becomes reasonably intuitive after a while. It's useful to remember when programming data into a channel: Each memory channel can store two frequencies and the parameters (CTTCS, Repeater Offset and direction, etc) for both of them. A simplex frequency stored in a channel will not be over-written when you store a different frequency in the same memory channel. The radio will receive on the original frequency but transmit on the frequency you entered second. A memory channel for a repeater need only store the receive and transmit frequencies and the transmit CTCSS tone. The repeater offset and the offset direction are unnecessary. To 'safely' re-program a channel, clear the channel of existing data first. Please note that what follows is not intended to be a comprehensive guide to setting up this radio. There are plenty of good websites which do that. I wrote this guide mainly for my own benefit by presenting the programming key-sequences in a way that I understand. Hopefully someone else will find it useful. The radio has two areas of memory. One area stores 41 parameters which affect the radio's operation - SQUELCH, STEP, Tx POWER, BANDWIDTH, Rx-CTCSS, Tx-CTCSS, BEEP and so on - and a separate area stores data for up to 128 Memory Channels holding receive and transmit frequencies etc. The 41 programmable parameters are accessed by pressing the [MENU] key to enter the menu system and then either stepping through all the parameters using the [▲] and [▼] keys or by jumping directly to a parameter by keying in its number. The numbers of all the parameters are listed in the radio's "manual" so there's no point repeating them here. Most don't need changing from their default values anyway. As an example, the STEP parameter is number '1' so keying [MENU] 1 will jump directly to the STEP parameter but - and this is important - the parameter hasn't yet actually been "enabled" for changing. Pressing [MENU] again will select the parameter (usually with voice confirmation) and allow you to key in (using the number keys) or step through (using the [▲] and [▼] keys) the parameter's options. Once the parameter's required option has been selected, pressing [MENU] will store that option in the radio's memory. If you want to change another parameter's value, key in the parameter's number (0 - 40) or use the [▲] and [▼] keys. Once the parameter is displayed, pressing [MENU] will open that parameter and show its currently-selected option. Again, key in a value or use the [▲] and [▼] keys (whichever seems more appropriate) to select an option and press [MENU] to store it in memory. When you're done, press [EXIT] to exit the menu system. Parameter #28. DELCH - DELete CHannel. Clears the data from the specified Memory Channel. Parameter #27. MEMCH - MEMory CHannel. Stores the current VFO (Frequency Mode) frequency in the specified Memory Channel. Remember that, along with the frequency, other parameters - such as CTCSS, Bandwidth, Tx/Rx Offset, etc - could be stored as well so it's always 'safer' to leave those parameters set to OFF unless they're specifically needed. And reset them to OFF once a Memory Channel has stored them to prevent them from inadvertently getting stored when you program the next Memory Channel. If you intend to store several simplex or repeater channels in consecutive memory channels at the same time, it's more convenient if you set up the radio's STEP and Bandwidth parameters first. It's definitely helpful to make a list of channel numbers and frequencies on paper before you start. With all the similar keystrokes, it can be difficult to remember where you're up to. Note that you must use the frequency on the top row of the display when storing the frequency in a Memory Channel. Use the A/B key to ensure the upward pointing arrow at the left of the display is on the top row. As noted above, there's no need to store the Repeater Offset or Offset Direction since both Rx and Tx frequencies are stored in the same memory channel. See here for the UK repeater list.